History: I started washing up at a local restaurant in Erina where I stayed for two and a half years while I finished my HSC and also studied hospitality. Funnily enough, I actually began my apprenticeship in the restaurant I now own. It was then called The Basil Pot. I worked there for a year and then went to Crowne Plaza, Terrigal. After completing my apprenticeship I went to London and worked for the next five years, working my way up to senior sous and Head Chef positions in 5 star hotels as well as restaurants such as the Park Lane Hilton. I also completed work experience in various “starred” kitchens in London, Scotland and Switzerland. I returned home to the central coast to settle at Lamiche, where I was Head Chef for three years, and finally take the plunge to buy my own small family run restaurant where it all started. At first no; I wanted to be a pilot, but health issues ruled that out! I fell into kitchen work thinking, what else could I do? I grew up in the kitchen with my grandmother and I thought this could be interesting. After a week's work experience, I was hooked and haven’t looked back. It has taken me around the world and allowed me to meet so many people; I don’t think I would have done any of that without being a Chef! Modern Australian. My food is a mixture of classics with modern interpretations, with mostly French or European but also some Asian and Latin influences thanks to my wife who is South American. Latin and Spanish flavours have started to have a big influence on me - not just because there is some exciting food and restaurants in Spain as well as South America, but my travels with my Latin wife and the food we eat, because of her culture, are having a big influence. I also like to play with classics people know, especially desserts…taking something they know and modernising it to a certain extent. Anything to do with food. I collect and have hundreds of cookbooks, not to mention magazines, cooking shows, websites, you name it. When it comes to food I’ll track it down. It really has become an obsession, not just a job! I would have to say my best friend, Craig Williams. 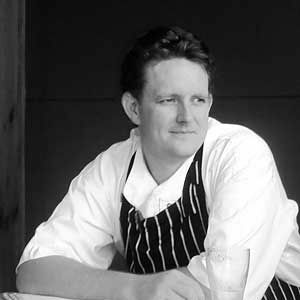 He was a great Chef who was the captain of the Junior Australian Culinary Team and, more recently, a commercial cookery TAFE teacher and above all a great friend. He taught me a great deal about food and also that to be a good Chef isn’t just about food, but the people you manage and how to get the best out of your team. He was a real inspiration and a good friend! Sadly he has a brain tumour and cannot work but he has been a mentor for a great many young Chefs besides myself. Certainly not the hours or lack of social life...the industry can be hard but if you love it, it becomes a lifestyle, not just a job. It’s a long hard road and you must constantly push yourself; I learn every day. But the people you meet and the feeling you get when a customer enjoys your food makes it worthwhile. I love vanilla; it’s just so great in obviously sweet but also even savoury dishes like a shellfish bisque with vanilla. Also butter and eggs - versatile for everything. And I’m a sucker for coffee and an ice cold beer. But that’s a Chef thing, I think! Most “eyebrow rising” menu item? I’m a big fan of slow cooking and offal and once a upon a time no one would go near such items but I think that there is a much broader food knowledge out there now and people are open to try new things. It’s great to see customers try something and be pleasantly surprised by a new food experience; it’s what being a Chef is all about! Stuffed pig's trotters is one of my all time favourites but only a select few are willing to try!!! Signature Dish: It’s constantly changing as to what is my favourite dish; I have a couple of staple dishes that are on the menu but they constantly evolve so nothing is the same for very long. But a scallop ceviche with crab mayo that I have on the menu is by far one of my more popular items.